Singapore – Digital creative agency noisycrayons has deployed a consumer engagement programme for leading publisher, Marshall Cavendish Education. Engagement activities, that are centered on the theme – ‘We’re having fun’, rally parents and students to share stories of their learning journey on social media. To demonstrate how a learning activity can be fun and interesting, parents and children are invited to challenge each other to a match of Word Tango – a social word puzzle that gamifies the learning of new English words. 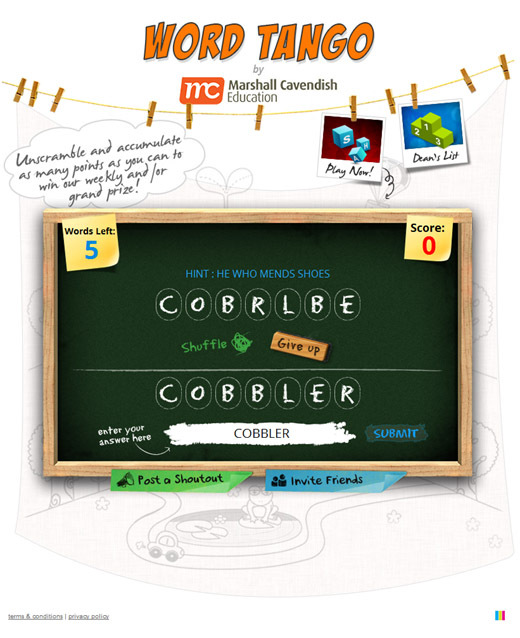 Players are presented with scrambled words to solve and points (and prizes) are awarded for every correct answer. The programme is an extension of the conventional peer-driven social media campaign. Instead of leveraging on friend-to-friend connections to amplify brand messages, we look into helping parents socialise aspects of academia and character development with their school-going children, therefore, leveraging on the social platform to address real concerns amongst parents and children. The initiative is expected to reach more than 1.5 million parents and school-going children in Singapore. Singapore-based SPH affiliate, noisycrayons, is also managing Marshall Cavendish Education’s ongoing communication and engagement efforts on social media.